At the Union Station the touring exhibit “Titanic: The Artifact Exhibition” will be making a stop in just in time for the 100th anniversary of the sinking of the Titanic. What will be on display are actual artifacts retrieved from the wreckage of that infamous cruise liner. Switching gears you’ll find that there are some exciting basketball championships headed into Kansas City at the Municipal Auditorium this includes the Big 12 women’s and men’s tournaments. And of course the Missouri Mavericks will be taking to the ice to the delight of many hockey fans. Perhaps you’d like to sit back and take in some spectacular performances. Then the Kansas City ballet production of “Romeo and Juliet” is just the right ticket. For classic music lovers the Kansas City Symphony presents an evening of Tchaikovsky and Strauss. And the “Michael Jackson the Immortal World Tour by Cirque du Soleil” will be making a stop in Kansas City at the Sprint Center. Anyone of those events would make for a memorable evening out on the town. It just goes to show you that Kansas City has a lot to offer its residents and visitors. Enjoying those events means you need to set some time aside which is important because “all work and no play…” you know how the rest of that goes! If you’re one of those people who simply can’t relax until all the chores and errands are done then perhaps you should think about enlisting some help. This help could come in the form of professional junk haulers who can help you clear out the clutter of your home – Junk King Kansas City. When it comes to your personal junk you have to make the decision as to what is going to be tossed out. For instance, many people hold onto old computers and monitors simply because they know they can’t be thrown into the garbage. But is there any reason to keep them in a closet or under a bed? The same can be said for an old mattress or busted dining room table sitting out in the garage. Just because you can’t throw it out the garbage doesn’t mean you shouldn’t get rid of it. 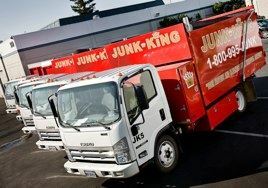 Designating a day for Junk King KC to come by your house and pick up all that junk will have you cleaning out the clutter in no time. Once all your junk is gone you can breathe a sigh of relief and truly enjoy some of the many events that are happening around Kansas City. This entry was posted in junk king kansas city, kansas city hauling, Kansas City Junk Recycling, kansas city junk removal, KC Junk Removal and tagged Get Rid of Old Computer, Kansas City Computer Recycling, Kansas City events, kansas city junk removal, KC Computer Disposal, KC Junk Removal on February 24, 2012 by Mike Stroud. Last updated August 2, 2017 .